Dark Tonic Games Studio: Wall Street Titan is officially Alpha! Wall Street Titan is officially Alpha! Yep, we hit the very important Alpha milestone recently, which means for the initial build of the game, all the features that are going in, are in, and working! Now all that's left is to polish up the content, fix any bugs, and optimize performance (which is currently stellar). For those that don't follow us on Facebook (and why don't you?!) we have another huge piece of news. We have brought on a new team member to finish up the audio on Wall Street Titan, and it is none other than legendary sound designer David Thiel! 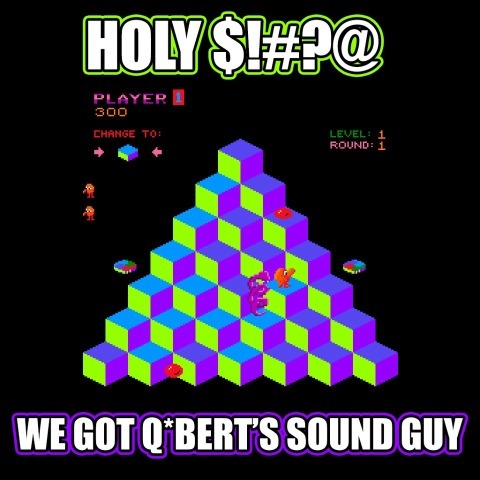 You may not know David by name, but you know the games he's worked on, like Golden Tee, the Three Stooges, and old school arcade gems Mad Planets, MACH 3 (the original laser disc game), and Q*bert! So, get ready for an awesome time! We will be submitting to Apple shortly, then you'll finally be able to smash up some tiny baddies with Wall Street Titan!